The day I saved three lives before 8:00 a.m. When I was young I was in a car accident and needed a blood transfusion. Today I try to pay it forward by donating blood to help others in need. The first time I decided to donate blood I was in college, and was looking forward to the free t-shirt and bonus points for my favorite organization. I was also very nervous about the experience. I am not going to tell you each time I donate blood it is a walk in the park. I have large veins which are easy for the phlebotomist to find, but that also means I tend to donate quickly, which can leave me light headed and nauseous. Once I discovered my donation works best when I am laying flat and not squeezing the ball, the process became much easier on me. Because of my love for international travel I have also had periods of my life where I am ineligible to donate because of time restrictions against a certain country or because of an immunization I received. To date, my travels have not permanently prohibited me from donating. Check into some other restrictions that may defer you from being an eligible donor (age, weight, tattoos, lifestyle choices, etc.). I am an O-, only 8% of Caucasians are! 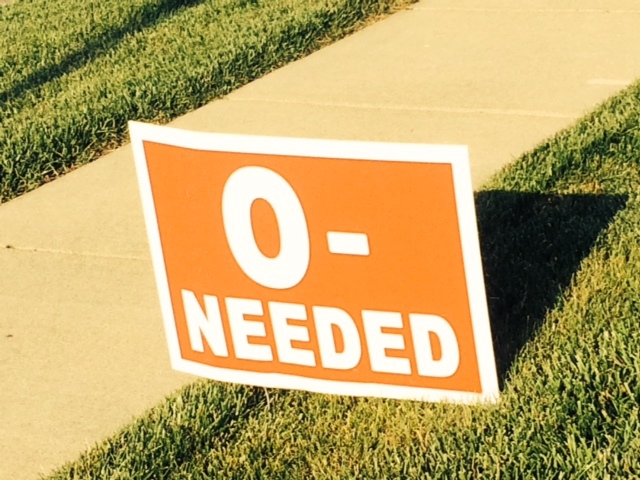 O blood types are also universal donors, meaning any other blood type can receive my blood. This particular blood donation facility opens at 6:30 am, which is great for my schedule. So I made an early appointment. I recommend a big glass of water and a snack before donating. Also, if you know you will be making a donation, try to increase the amount of foods high in iron that you are consuming (beef is an excellent source, as are leafy greens and legumes). When I got to the facility we went through my check in, which includes a trained professional collecting my temperature, pulse, blood pressure, and hemoglobin and iron (via fingerstick) – this is where a diet high in iron becomes important. If you are in good health, you should not have a problem with these pre-tests. You will also be asked a series of questions about your health and medications, these questions should be taken seriously as you are donating for other people. A blood donation should not be a place where you are trying to get blood test results for yourself. Once you are comfortably seated in a chair, your arm is thoroughly cleaned with iodine. I do not like to watch them insert the needle, so I look away. I can handle animal blood and blood from others all day, but am not a fan of seeing my own. The process is usually pretty quick, about 10-15 minutes (allow yourself about 1 hour from check-in to check-out). They fill a couple of little test tubes for preliminary testing of your blood to ensure you are healthy, and then they just take a pint! 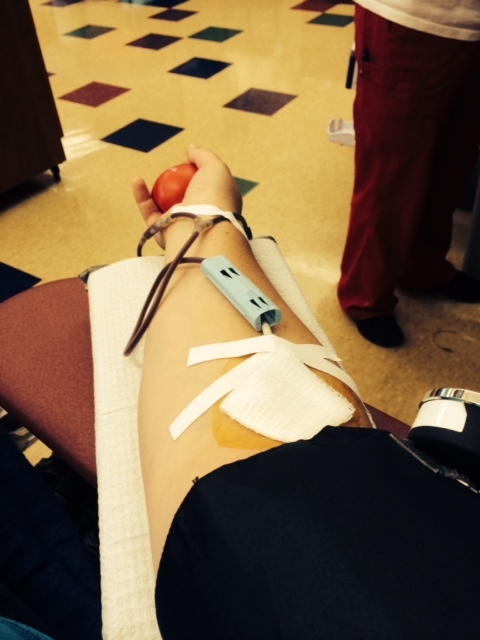 One pint can save up to three lives! I encourage you to check into donating blood if you are able and willing. Most people say they never volunteer to do something because they are not asked, today I ask you to please think of becoming a blood donor. Your generosity could be the key to saving lives – it saved my life! 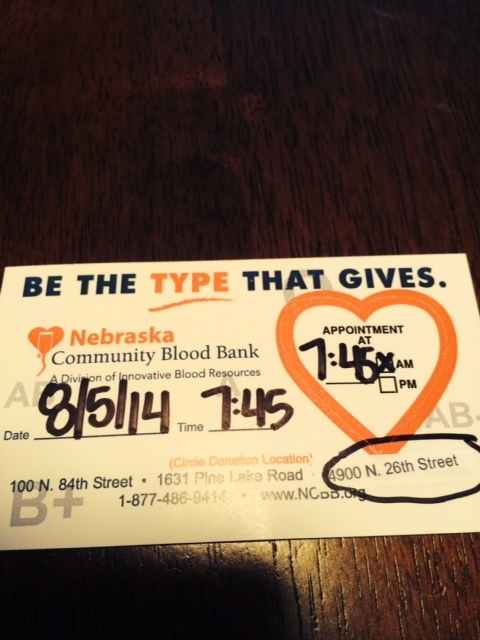 The American Red Cross Blood or the Nebraska Community Blood Bank. Very cool. I’ve not been an eligable donor for many years because I’m always in the tattoo studio, but my husband donates. I’ve never needed a transfusion and hope that doesn’t change but appreciate you and everyone else who gives a little piece of yourselves to save others. Hi Shanna, I was eligible for a couple of years because of tattoos too 🙂 Glad to hear the hubs is a donor. We never know when we may need it! Take care!